In 2010 (and even to date) this has been one of the creepiest of our tours yet. 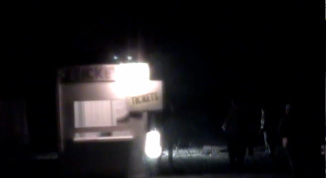 We drove into a big empty space around a wooded area, for a while we thought we were in the wrong spot, nothing and no one was around and then finally we saw the ticket tent. Although there were a few cars parked there, we only saw a couple of people selling tickets, and we wondered what did they do to the other guests/victims as we did not hear anything but dead silence. Usually we at least hear some screams or something but not here. After we purchased our tickets they gave us a glow-stick to put around our necks and told us to head out on the trail. This was very creepy - again, no one was around and dead silence, and this was a large outdoor wooded area - we thought we could hear something moving in the shadows just outside the lit path we were following, but no one said anything. We ventured upon different scenes with a lot of distance in between each - so we walked for a long time, One scene was nothing but some branches and twigs set up in a "Blair Witch" fashion, we didn't know if someone was going to pop out or not - intensely creepy. Also along the path was a cabin with a small lake (real one) and a boat in it and a sign that said "Camp Crystal Lake" and there was a tent - and when we approached the tent we were expecting Jason to pop out - nope!, he came out from by the lake instead - an excellent twist on the usual scare. There was a scene from "The Ring" where Samara came out of a well. There was also a pig character in a grill and some other scenes. We never knew when a new scene was going to start or a current scene was going to end. They had about 6 or 7 scenes set up very well and a lot of in-between space to walkthrough - which, unlike the dark mazes inside of haunted houses which usually annoy more than scare - this experience of never knowing what or who was where or knowing if someone would pop out on the trail at any given time made this one of the most intense of the outdoor haunts we ever toured. The only real pitfall was Paul's foot was hurting that night when he tripped over a bump on the path and when he stopped to take a rest one of the workers vehemently yelled at him to keep going, and she showed no sign of caring or compassion at all. Other than that this was a very worthwhile addition to our list and one we knew we would want to return to, unfortunately this haunt took a deep dive downward when they returned in 2012 (they did not run in 2011 ). Ok, so with high anticipation for this haunt from our 2010 visit we returned with eager anticipation - and Laura - and were more than willing to pay the high price tag as we knew this haunt was well worth it. We couldn't have been more wrong. All of the scenes that made the 2010 visit so great were gone, replaced by random zombies - and very few at that - on a couple places on the path. A loud heartbeat could be heard throughout the haunt and when you got to the center that's where it was loudest, not much there though. There was a bridge and a tent that was an ok setup, and there was at one point a guy with a chainsaw - that kind of worked. That was it. This was a terrible haunt. What this did have going for it was the fact that it was the same location and it was still creepy - if you were walking here with no haunt the area would be creepy - at one point Paul vanished and a guy with a chainsaw came out of nowhere and it was like a scene from a movie. When we reunited we were all ready to go but the signs to the exit were misleading and it took longer to get out while walking through nothing - there were some man-made things to hide behind but nothing was there making this haunt a haunt not worth returning to, unless they changed it up again - the high price tag, the few actors, the annoying exit path all add up to give this a far lower score then the 2010 version. We would not return to this haunt again unless we heard from someone not associated that it was re-vamped much differently from this year.